3 nights in Turnberry – 4 nights in St Andrews, playing 8 of our best courses- This one is definitely aimed at the golfer who still has a few items on his bucket list to cross off! One for the big hitters! 10 nights with 9 rounds of golf. Enjoy 3 nights at ‘The Home of Golf’, followed by 3 nights in Aberdeen before returning to stay at the stunning Archerfield Estate for the final 4 nights. Along the way you will play the likes of Kingsbarns, Cruden Bay, Muirfield and Gullane 1 (where Rickie Fowler won the 2015 Scottish Open). With just over 260 miles from the most northerly course; Royal Dornoch to Royal Troon in the south, you can enjoy some spectacular scenery and spectacular golf on this trip. Add in St Andrews and Carnoustie, both on the east coast and you have an amazing vacation as well as 8 challenging rounds of golf! 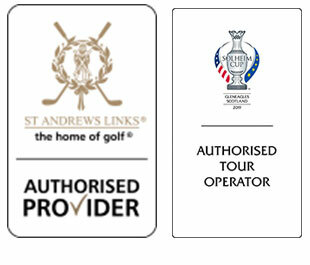 Golfers will enjoy 3 locations in Central Scotland: Troon, St Andrews and North Berwick Lots of excellent golf and a couple of days with transfers taking just a few hours each. One our clients earlier this year said he was here competing in a “golf triathalon” - golfing / eating / drinking. There is nowhere better to compete in that sport than St Andrews. Great golf, plenty of quality restaurants, and lots of amazing wee pubs and bars full of golfers and caddies swapping stories. Book it now. Price includes – private driver for the duration of your tour – meet and greet service, complimentary use of local phone, maps, local taxes Based on 8 golfers sharing (please contact us for a quote for other group sizes) Supplements apply for room upgrades, additional golf & dinners, etc. Enjoy the western delights of Scotland – spend 3 nights in the picturesque village of Machrihanish followed by 3 nights in Irvine, near Troon playing 3 great links courses in the area.